Howard Dean: "I'm Running for DNC Chair"
For those who don't remember, Howard Dean presided over a revitalized Democratic National Committee through the 2006 General Elections, when incidentally Democrats won every race in Watauga, from County Commission to NC House and Senate seats, and through the surge of 2008 when Barack Obama won the presidency and the Watauga GOP didn't even field a single candidate for County Commission. Come back to the raft, Howard honey! We're waiting for you! Labels: Democratic National Committee, Howard Dean, revolution in the U.S. Please , please , please , let"s go forward not back. 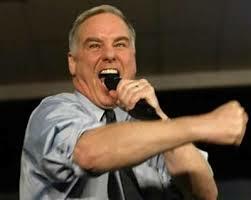 Howard Dean should be honored for his 50 state strategy and its success should be reproduced. The bolder and needed move would be to start listening to the Sanders / Warren portion of the Party and support Keith Ellison. Amen. Howard Dean has been a lobbyist since 2009--enough with the oligarchy/establishment appointments. Its why we lost, and if the dems don't learn that lesson, the party is going to die. Keith Ellison is a much better choice. Sanders would have mopped the floor with Trump, but the DNC rigged it for Clinton and got what it deserved. I agree with the above comment Sanders/Warren portion of liberals is where the DNC needs to move. At least Howard Dean did not manipulate the primary to screw Bernie out of the nomination. Between Debbie Wasserman's antics and Donna Brazile's helping Hillary by sneaking her the debate questions before she and Bernie debated, it's a wonder he came so close. Just think, if our DNC had run an honest primary, we might be talking about President elect Sanders today. The DNC completely disenfranchised the young voters in this country by ramrodding Hilary through the primary because she was the "chosen one" and it was "her turn." It is obvious to every free thinking person and voter that the DNC manipulated the outcome of their primary. It is going to take a lot to win the independent and youth voters back into the Democrat's fold. Howard Dean is a part of that DNC elite establishment that anointed HRC behind the DNC's closed doors. He was a super delegate - how did his vote go? The DNC needs to start fresh and start thinking like a start-up third party if they want to return to their inclusive mission and win back these voters. Howard Dean is a signal that the DNC will continue as "business as usual" and continue to contribute to these disastrous outcomes.